You don’t have to do anymore than watch a slo-mo of a good golf swing to recognize just how aggressive the hip rotation is during the golf swing. In particular, it’s essential for hitters to have sufficient hip internal rotation. Tour players have been shown to have hip internal rotation of at least 45 degrees on both sides, not having adequate hip internal rotation will limit your ability to rotate in the golf swing, possibly resulting in sway or slide during the swing. Unfortunately, these ranges of motion are usually the first to go in the dysfunctional lumbopelvic (hip/lower back) postures we often see with younger athletes or desk jockeys. As the pelvis dumps forward into anterior tilt, it blocks off internal rotation – and the athlete will extend and rotate through the lower back instead of the hip. This leads to not only limited hip function, but also an increased risk of injury. The athlete may develop a number of hip issues (bony overgrowth on the head of the femur or the hip socket, a torn labrum, sports hernia, etc). There may also be extension-based lower back pain, including stress fractures and disc injuries. Many of the hip mobility restrictions we see in these athletes aren’t just because muscles are short, or bony blocks have developed to restrict range of motion. Rather, they may be in place just because the athlete’s core control is so out-of-whack that alignment issues limit range of motion. The good news is that it’s often possible to get quick changes in an athlete’s hip mobility just by modifying posture, incorporating positional breathing, and doing a bit of activation work. I’ve regularly seen athletes gain 10, 20 or more degrees of hip internal rotation in a matter of 30 seconds without stretching or manual therapy, adding some core control in the right places can definitely be a powerful thing. Remember, the research clearly demonstrates that the core works to transfer – not develop – force during the golf swing. Its job is to take the force developed in the lower extremity and make sure that it is delivered to the upper extremity and, ultimately, the club. This function should be reflected in the exercise selection we use, as we gravitate toward rotational medicine ball variations and chops/lifts rather than sit-ups, crunches, and side bends. 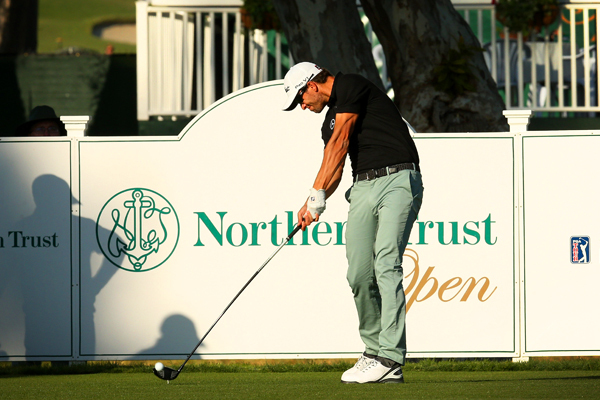 Take a look at the video below of Jason Day’s swing sequence – like all long hitters – gets his hips moving forward while his hands are still held back and up in transition from the top of backswing. To do this, you need three things. We’ve covered the first two: hip mobility and core stability. However, you also need sufficient mobility through your upper back to allow this “separation” to occur. Even if the hip and core components are ideal, if the upper back isn’t sufficiently mobile, the hands can’t stay back to allow a) the x-factor stretch to be increased b) force transfer without “energy leaks” and c) the right timing for this transfer. I should note that while thoracic rotation (transverse plane) is predominantly what we’re seeking, you can’t have sufficient rotation if you’re stuck in a rounded upper back/ forward shoulder posture (flexion/sagittal plane). If you look like this, you’ll need to get your extension back to help unlock the rotation you seek. 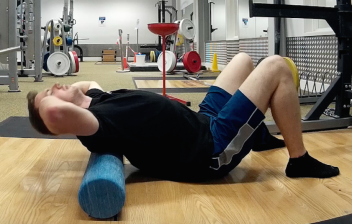 (t-spine mobilisations on a foam roller are great way to develop thoracic extension and fix your hunched posture). In the golf swing, you see a small amount of hip flexion as we go back, followed by seriously powerful hip extension in the downswing. It’s important though to distinguish the hip hinge (the hip flexion in the backswing) as pre-loading, whereas the extension and internal rotation that takes place in the downswing is actually unloading. In other words, the former stores the elastic energy we need, while the latter releases it over a sufficient range of motion to generate as much clubhead speed as possible. To be honest I’m actually shocked at how many, even advanced, golfers have lost the ability to hip hinge correctly. And they’re usually the higher level guys who have hip and lower back problems too! If you can’t effectively pre-load your hips, you’ll have to go elsewhere to get your power – or you just won’t create it. As a general rule with my athletes I look to develop a good hip hinge pattern with Bulgarian bag good mornings, barbell RDL’s and Kettlebell deadlifts, then to load up the pattern with heavy barbell RDL’s, Trap bar deadlifts and Sumo deadlifts. You don’t have to be an elite powerlifter or Olympic lifter to hit home runs. However, you do need enough strength and – just as importantly – the ability to display that force quickly. On the strength side, I seriously doubt you’ll find many hitters in the big leagues who aren’t capable of deadlifting at least 1.5 times their body weight, and if you do find some, they’re probably guys who have been around for quite some time and gotten much more efficient with their patterning to use every bit of force they have in the tank. Or, they’re just carrying too much body fat. On the power side, it’s not good enough to just be a weight room rockstar. It’s also important to be able to take that strength and apply it quickly in more sport-specific contexts with drills like rotational medicine ball throws, sprinting, jumps and lateral jumps. Once you’ve got the foundation of strength, your power training can really take off – and that includes your swing mechanics. Until you’re able to put more force into the ground, it’s going to be difficult to generate more clubhead speed unless you have glaring deficiencies in your swing mechanics that can be cleaned up. For more on developing strength and power in a golf-specific context take a look at this article. If you take a look at the swings of the best golfers in the world you will see that whilst the pelvis usually starts in a neutral, it moves into a small amount of anterior tilt in the backswing and posterior tilt in the downswing. Note how Rory’s belt line moves slightly to point dow towards the floor more as he swings back, then moves quite a bit during his downswing to a much more horizontal position at impact. This really piggy backs on point number 4 from above, as we discussed there in order to generate power in the golf swing. We must first go into hip flexion to create power then quickly reverse this and extend the hip to release that power in the downswing. The problem with this is that a hip flexion to extension pattern causes the head to move down and up if neutral spine is maintained. The shift from anterior to posterior pelvic tilt allows us to extend and rotate the hip in the downswing, clearing the way for an ideal club path and angle of attack with the ball striking advantages that accompany that, without the head moving up and down too much, and the difficulties in timing and maintaining our centre of gravity and stability that would bring. So there you have it, there’s my list. This is only my top 6 though and by no mans is it exhaustive, ankle doors flexion, ankle supination and pronation and glute strength are few that come to mind that could easily have been included too. Anything else you’d add in? What would your top 6 look like? This is the 2nd time I've seen this online posted as being written by Nick. This was written by Eric Cressey along with about 5 other articles Nick has claimed to write. Please stop taking credit for other people's work. Very well written, thanks Nick! Nice work Nick! I love the use of slow motion videos of Jason & Rory's swing to support your points. I would couple Glute & Shoulder Scapular Stability along with Core strength & control. Hard to leave that combo out but thought your top 6 was right on. I'm currently working with a long drive competitor (construction guy) & he displays the same qualities from Level 1 & 2 TPI screens. It will be interesting to see how much he improves with additional exercises I gave him. Thanks Sean! 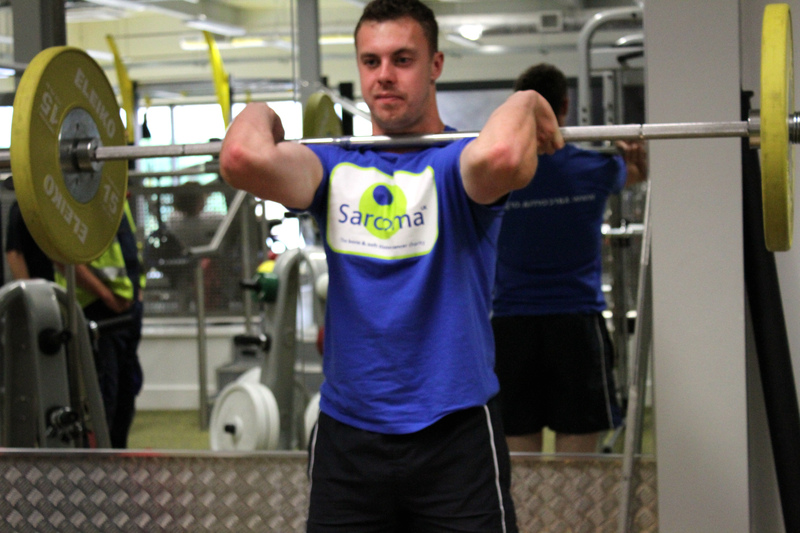 I would probably agree, scapular stability is top of my list to include in the next edition! haha. Sounds interesting, keep me updated over on Facebook or something won't you!